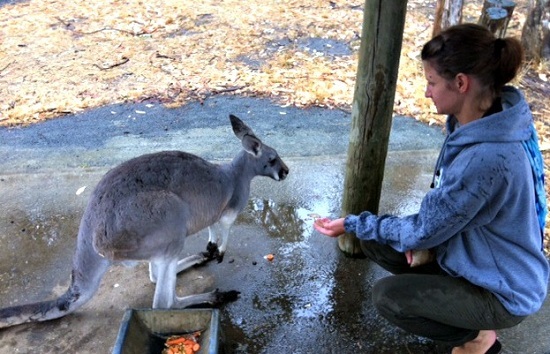 The day I set out to Cleland Wildlife Park up in the beautiful Adelaide Hills, it was raining. And I mean it was really raining. With not a drop of rain in weeks, highs of 44 degrees Celsius and state-wide fire alerts, who could have known that the day I chose to stroll around the great outdoors petting Australia’s wildlife, the heavens would open up? It didn't spoil my day up at Cleland though. Not even a torrential downpour could dampen my spirits on the day I was meeting some of Australia’s most intriguing (and cutest) inhabitants. Make no mistake - Cleland Wildlife Park is no zoo. Despite a cafe and a shop selling everything from kangaroo magnets to koala t-shirts (and waterproof ponchos thank goodness), it’s the animals that matter here most, not the tourists. This is apparent at every turn within the park - it can be seen in the lack of cages, within the contentment of the animals and in the attitude of the rangers - and it’s one of the reasons I enjoyed my day at Cleland so much. After being surrounded by a team of enthusiastic potoroos (not quite squirrel, not quite kangaroo) I made a puddle-soaked dash to see the koalas. These koalas weren't in the mood for cuddles (although neither was I - maybe it was all that rain) so a few of us took turns to have our picture taken with Rusty, a female koala merrily feasting on a breakfast of gum leaves and…well, more gum leaves. Chatting to the ranger in charge of Rusty, I discovered just what keeps these furry little guys happy. The ranger explained that koalas only eat one thing - eucalyptus (or gum) leaves - but they eat a lot of them, consuming up to half a kilogram every day. 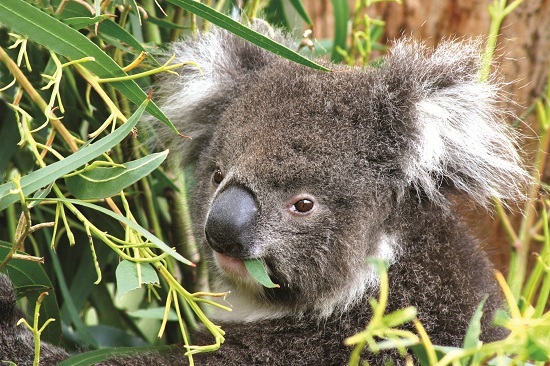 The rest of the time they tend to sleep, so don’t expect too much activity from the koalas, except from continuous chewing and a whole lot of looking cute. My next stop started as a less sheltered one as I was determined to feed a kangaroo if one was willing. I soon found that in fact quite a few were! Standing out in the pouring rain suddenly seemed less of a problem when a family of kangaroos surrounded me, spurred on by the sight of the food bag I’d purchased at the park shop. They were a friendly bunch though, who were evidently used to visitors, and I spent a wonderful hour or so huddled with them under a small shelter we eventually moved under. Once my bag of food was empty we watched the rain together for a while before I left my new-found friends and made a dash for the bird park. The main focal point of the bird park is the huge lake where all kinds of ducks, swans and other native Australian birds live. Unlike some of the other animals in the park who were sheltering from the rain, the wildlife around the lake was teeming with excited activity. A crowd of small ducks waddled to greet me while further up, pelicans scooped fish out of the water with their huge, almost cartoonish, beaks. 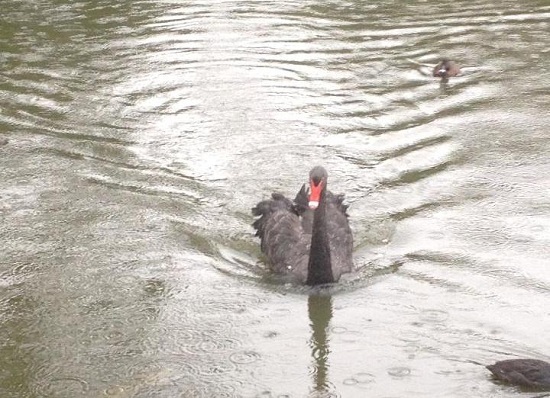 A short walk along the edge of the lake (ducks in tow) I saw a magnificent black swan swimming towards me. I was momentarily transfixed by its beauty. That was until I realised it was advancing towards me at some speed - and didn’t seem particularly pleased to see me! I stepped back from the water’s edge and nipped through a gate to the next part of the park just as the magnificent bird raised its wings and stepped out onto dry land. Among the Australian animals I viewed only from the safety of behind a fence that day were the emu (looking even angrier than that black swan) and the Tasmanian Devils (who can blame me there?). On leaving Cleland later that day I was happy with my close encounters though. I had a strong sense of being on the animals’ turf, rather than viewing them passively through a cage, and this seemed to suit both them and me. I left the park satisfied with my experience...and looking forward to finally heading indoors to dry off. Kirsty Stuart left full time employment in 2012 in a perilous bid to write more and travel more. Her plan worked and these days she enjoys doing just that while also helping other writers and free-spirited entrepreneurs do the same via her website: Freelance Writers Online.